For the woman who appreciates style and beauty, this lovely basket overflows with an attractive mix of colorful live plants that she is sure to enjoy. 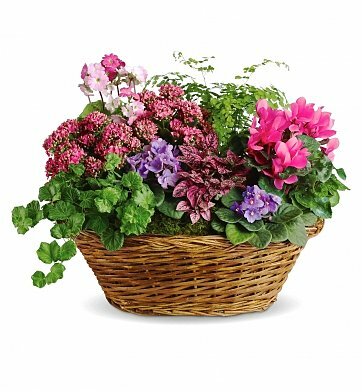 A charming wicker basket is arranged by hand with flowering plants such as African violets, pink kalanchoes, cyclamen, primrose, and hypoestes. Lush green ivy and maidenhair fern complete this impressive basket. Potted Lavender Miniature African Violets. Measures approximately 24" x 19". Simply Chic Plant Basket is a hand delivered gift. These gifts are delivered by one of our local design centers located throughout the United States and Canada. Same day delivery is available for most gifts when ordered before the cutoff time. The cutoff time for Simply Chic Plant Basket is 2 PM in the recipient's time zone. A plush living basket of plants and flowers. Colors a little different, but still pretty and fit in with other flower sprays that were given. My mother in law gushed about how big and beautiful this was and very pleased that she can tend it for a long time. She lives alone and I wanted her to have something that would last. She remarked that the basket itself was also very lovely. Made her week!